ABIT is known primarily for its high-quality mainboards. However, it also deals in production of PC multimedia devices. 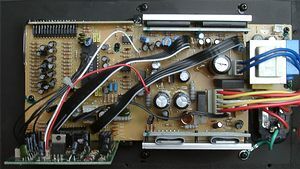 You all know its AU10 sound card based on the 6-channel HSP chip ForteMedia FM801AU. Despite a low price of the card (less than $40) it includes a remote control and a licensed version of the WinDVD 3.0. Soon we are going to review an inexpensive external 6-channel audio USB device (based on a high-quality multibit 24/96 DAC from AKM, and supplied with a remote control and a licensed version of the WinDVD 3.0). 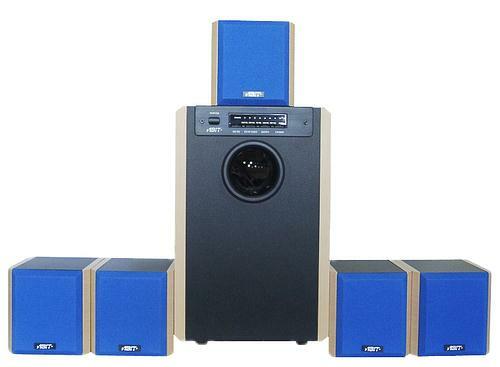 The active 5.1 SP-60 acoustic system was released by ABIT in March 2001 and has rather low price (approx. $200). The system doesn't have a DolbyDigital/DTS decoder, that is why it suits excellently for analog connection to a computer equipped with any 6-channel sound card and a program DVD player. The ABIT SP-60 doesn't include a remote control. But this problem can be solved with the help of above multimedia devices from this manufacturer. The system has a connector for stereo devices, for example, for a radio tuner or a portable CD player. However, this system can also be connected to an external hardware decoder, a DVD player with a built-in decoder and to game consoles. The system ships in a dark blue package which weighs 20 kg. The heaviest device is a 13-kg subwoofer. The other stuff includes 5 satellites and cables. The system is wooden. All parts are fitted excellently. The speakers have "sealed box" acoustic scheme. The panels of the satellites are 1 cm thick. Each speaker contains batting to suppress vibrations of the back panel of the loudspeaker's cone. Speakers are not large in dimensions as compared with the subwoofer. All satellites are equal in size: 116x120x126 mm, and as they are rather small you will hardly face any problems when placing them on your table. 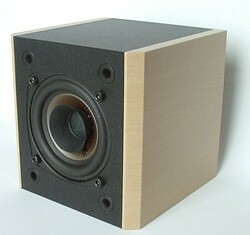 The central speaker has a high-frequency dynamic loudspeaker in the center of the cone. The cones are 7.5 cm in diameter; the corrugation is made of soft gum. The satellites are magnetically shielded. The impedance of the loudspeakers is 8 Ohm. The central speaker has a HF loudspeaker in the middle of the main one. The other speakers have a paper trumpet. The loudspeaker's cones are made of rigid plastic. However, paper is still one of the best cheapest materials. Reportedly, this system was developed for ABIT by third engineers who specialized in expensive Hi-Fi equipment and who developed several models for Sony. On the back there are spring clamps and holes to mount the speakers onto vertical surfaces. But I don't recommend to hang the speakers far from each other as their volume and panorama reserve is not great. Unfortunately, they have neither legs nor supports. But each weighs almost a kilogram, that is why they shouldn't move along the table because of vibrations. The subwoofer is based on the resonance chamber with phase-inverter. 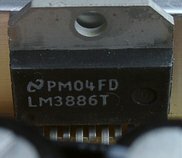 A resonator tube, which gives the lowest frequencies, is output onto the front panel. The phase-inverter hole looks downward. As the hole is separated from the floor by just half a centimeter the phase-inverter is acoustically loaded up. 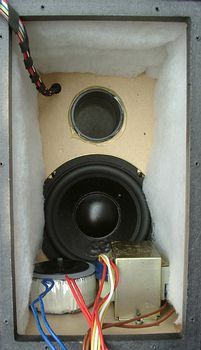 The low-frequency head installed on the partition is directed by the loudspeaker's cone to the back panel, towards the chamber with amplifying cards and two transformers. The side and upper panels are covered inside with a 1cm layer of batting. Both transformers are not large and are screwed to the lower panel. They are placed not far from the amplifying part which is a cost of a lacking external power supply unit. But at the same time the developers were able to avoid too great pickups caused by alternating current. The LW loudspeaker's cone, 16 cm in diameter, is made of impregnated paper. The corrugation is made of rubber, like that of MF loudspeakers. 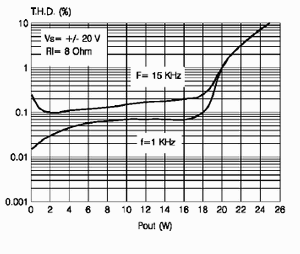 The impedance of the dynamic loudspeaker is 8 Ohm. The wooden panels of the subwoofer's cabinet are 15 mm thick. The subwoofer stands on plastic 15-mm legs. As the LF speaker is encased, you can place the subwoofer under the table or close to the wall or your system case. Digital management buttons (Up, Down/DSP). The screen displays a loudness level and an adjusted parameter (they are six: overall volume, volume of a subwoofer, rear speakers and a central one and a 3D sound mode). The Function button switches them in turn. The Up and Down help to adjust a volume level of the chosen parameter. The DSP button (combined with Down) turns on 3D sound so that a stereo signal can proceed to all five speakers; it is interesting that the sound becomes very rich in highs. It is a bit inconvenient that modes are switched in a circle, and to get the previous mode you need go through the rest. However, it doesn't take much time to get used to the digital control. 6-channel input with a mini-DIN connector (G9). and one TDA7261 from ST. Earlier we often mentioned that the graphs were given for a higher voltage level than the feed circuits of the tested samples had. That is why the graphs are shifted to the left and the characteristics become worse. Many ask why we think so. 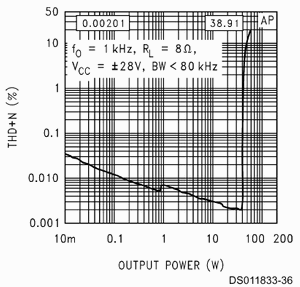 The graphs taken from the specification show excellently how power depends on supply voltage. Severe distortions at the maximum power can explain you why your acoustic system acquires such a great deal of distortions at the maximum volume level. The matter is that the amplifiers are not designed for operation in the maximum amplification mode. You shouldn't mind hundreds of Watts indicated on the stickers. Do not turn up the volume level over 80%. The TDA7261 and LM3886T chips amplify a signal passing to the central speaker and subwoofer. 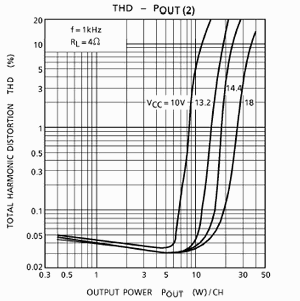 The power is still enough high at a low THD level. Taking into account how the dynamic loudspeakers look like, such values can be considered acceptable. But sound quality may disappoint you a bit in DVD movies. We connected the system with three 'minijack <-> two PCA' cables which were not supplied with the card (ABIT equips its SP-60 set optionally with a cable with three minijacks for connection to any sound card). However, you can use the bundled cable if you have an AU10 sound card (G9 connector) or if you use an external 6-channel USB device UA10 from ABIT. By the way, in these two cases you get a remote control for working with the licensed WinDVD 3.0 which supports DD5.1/DTS decoding at the lowest expense. The cables connecting the speakers with the subwoofer are long enough to place the system in any room. Cables for the front speakers are 6 m long, for the rear ones - 10 m long and for the central one - 4 m long. Listening helps to determine how well one or another acoustic system reproduce various musical compositions, audio tracks in movies, effects in games etc. But different people establish different criteria. As you know, if you are short of money, price plays a vital role. A user wants to know which acoustic systems play the best in a certain price range. When we are talking about sounding we mean its strong and weak points. In the listening tests we estimate a distortion level, timbre, a dynamic range, stereo panorama, balance, dynamic reserve etc. All these characteristics are the criteria of quality of an acoustic system. The SP-60's sound doesn't impress much. When you are looking at wooden cabinets 1 cm thick and loudspeaker's cones of the special design you expect something more. The sound of this system is lacking for transparent highs and carries a lot of distortions. 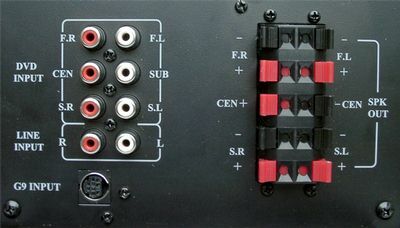 The central loudspeaker with a high-frequency speaker doesn't make any cardinal changes, though replacement of one front satellite with the central speaker improves the sound. Timbre tint is peculiar to computer speakers with a narrow frequency range. Wooden cabinets improve the situation, while plastic ones just add some unpleasant plastic sound. Taking into account that the speakers do not have any supports and the loudspeaker's cones are not directed at a listener the stereo panorama sounds very well. There are much less complaints about the subwoofer. Up to 50 % the sound is decent. But after this mark the subwoofer becomes pressing as compared with the speakers. The lowest sounds are blurry, and additional resonances can be heard at certain frequencies. MP3 files (192 kbps) are more difficult to reproduce for the ABIT SP-60 system than wav ones. When we listened to MP3s, different sounds were mixed up and none of the instruments could be heard discernibly. So we decided to carry out an experiment to find out who's to blame: the amplifier or the speakers. Taking the SP-60 amplifier we compared other models of speakers (of the same price niche): F&D IHOO front speaker and Creative CSW DTT3500 satellite; and on the IHOO amplifier we tested SP-60 loudspeaker, DTT3500 speaker and IHOO front speaker. The smaller DTT3500 produces more highs, though the sound coloration is similar to the ABIT's model. The IHOO which has a larger dynamic loudspeaker than the SP-60 sounds clearer, evener and softer. Besides, all the speakers played better on the IHOO amplifier. It means that the speakers limits the sound quality of the ABIT SP60 system to a greater degree. On the whole, the SP-60 system performs better in movies and games than in the previous test. The central speaker lacks for good mids which is excellently noticeable in dialogs. As for the other speakers, I wouldn't move them too far as the volume reserve is not great. If the sound coming out of the subwoofer in the music tests was somewhat blurry and resonant at low frequencies, in movies and games it is unnoticeable. Blow-offs of the cars and grenades were reproduced excellently. It is connected with the fact that a human ear doesn't try to catch pitch of tone in the rattling sound and synchronize it in the temporary realm relative to the general sound. The measurements were carried out according to the single technique by the RMAA-AE 3.2 program. As an AFC of satellites much depends on directivity they should be directed at the listener. The graphs of the satellites are broken very much, though other multimedia speakers have the same. The graph of the subwoofer is decent. However, in the tests we noticed loud parasitic sounds at some frequencies. The multimedia acoustic systems make the following psychological effect: when we see small plastic satellites of the DTT3500 we expect awful quality of the sound. At the same time, their sound exceeds all expectations. And the ABIT SP-60 systems looks so great that when it starts playing you get disapointed. But if you take into account that the ABIT SP-60 is just an inexpensive computer acoustic system meant for games and quite seldom for DVD movies, you probably won't lose your hope. The developers should install higher-quality speakers and improve the amplification path to justify the hopes. However, it will immediately tell upon the price. On the other hand, we think that not everything is optimal in this system. First of all, the developers used too small odd in design dynamic loudspeakers with a double cones in too large for them satellite cabinets. If the protective grills hide the loudspeaker cones, so why to use such unusual design of the dynamic speakers? The subwoofer also has some drawbacks for its dimensions and price range. additional sounds coming from the subwoofer.